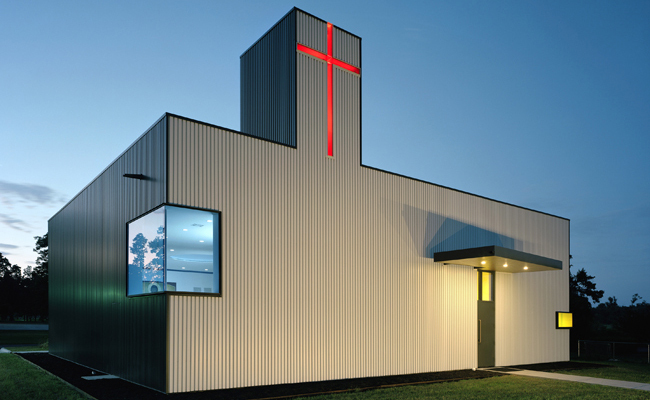 Saint Nicholas Orthodox Church has been the recipient of several awards, both national and international, for its unique architecture and the way a simple, metal garage was transformed (transfigured) into a place where the Church gathers to worship the Risen Lord. Saint Nicholas Eastern Orthodox Church transformed a generic shop building into a place of worship and fellowship. The existing structure was oriented in opposition to the Eastern axis that typically prevails in an Orthodox Church, so a narrow addition was placed on the western side, allowing the narthex to be folded, ending at the base of the tower. The skylit tower pours red light down into the transition between the narthex and the sanctuary, giving a moment of pause before entering to worship. A narrow cross is suspended on the western side of the tower, backlit by the morning sun to become a beacon for arriving parishioners. Once inside the sanctuary, a transom that spans the entire width of the space faces east and bathes the space in soft morning light during Sunday morning services. The exterior skin is a box rib metal panel, common in local industrial buildings, while the interior finishes are kept simple, though handled carefully. Portions of the existing building are still exposed, reminding visitors of the history of the site and the transformation the church has undergone. Please contact Fr John if you would like to visit our building, but most especially if you would like to experience the ancient worship of the Orthodox Church.